"The senses, being explorers of the world, open the way to knowledge. his explorations of the world…..."
A young child can remain unmoved by a myriad of sensory impressions in her everyday environment. What she needs is not more and more impressions but the ability to understand what she is perceiving. The Montessori Sensorial Materials help the child to distinguish, to categorize, and to relate new information to what she already knows. Dr. Montessori believed that this process is the beginning of conscious knowledge. It is brought about by the intelligence working in a concentrated way on the impression given by the senses. Size in three dimensions is introduced to the child by the use of the pink Tower. This is a series of ten pink cubes graded in size to form one centimeter cubed to ten centimeters cubed. The child builds a tower beginning with the largest cube and ending with the smallest cube on top. The Brown Stairs introduces the child to difference in size I two dimensions. The child must place the blocks in proper gradation forming a stair-like structure. With this exercise the teacher introduces the concepts of thickness and thinness, using the terms think, thicker, thickest and thin, thinner, thinnest. The Red Rods help the child to recognize differences in size in one dimension—length. The child is introduced to the terms short, shorter, shortest and long, longer, longest. This equipment gives the child a sensorial basis for learning to count when he begins mathematics. The food is covered by cheesecloth or a perforated top so that the child can smell it, but she can’t see or feel it. Each jar in the first set has a mate in the second set. The child combines the pairs by carefully smelling each jar. The teacher uses this exercise as an opportunity to build the child’s vocabulary by teaching her the names of the foods she is smelling. The child’s first introduction to color is a box containing six tablets—two red, two blue and two yellow. They differ only in highly contrasting color. In this exercise, the child pairs the tablets and learns the corresponding names. For the next step the child may use a box containing eight different shades of eight different colors. The child must distinguish the intensity of the shades and place the tablets in order from the lightest to the darkest shade of each color. Teaching children to be aware of fine differences in color is giving them remote preparation for all kinds of scientific observations, art, art appreciation, decorating, and many other meaningful activities. This exercise enables the child to become familiar with the details of the beautiful art while refining her visual discrimination. A box containing three sets of little blocks of wood, each set varying slightly from the other two in weight. The blocks also differ in color, so that the child wears a blindfold while doing the exercise. This eliminates the visual difference and enables the child to sort the blocks by weighing them on the tips of his fingers. The art of listening carefully is a quality worth cultivating for a lifetime. Listening attentively is a vital preparation for reading. 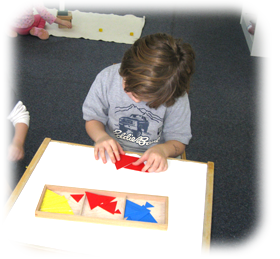 Montessori designed several sensorial games to help the child concentrate on a particular sound. To help children become more aware of the intensity of sound, Montessori designed a set of six cylinder-shaped brown wooden boxes with red tops. Another quality of sound that is interesting to the child is pitch. To isolate this quality, Montessori designed a set of black and white bells corresponding to the black and white keys on the piano. Contains a collection of familiar objects such as a cup, lid, pin, string and ball. The child grasps each object and names it without looking at it. A parallel exercise for educating the tactile sense is a box containing many pairs of swatches of different materials such as wood, flannel, silk, cotton, velvet, canvas, lace, etc. The child mixes all the swatches, puts on a blindfold and then identifies the pairs by feeling them.